When I was an interventionist looking at our schoolwide data, I noticed something in our students’ math data. The students in third grade that scored lowest in math overall on our benchmark testing (NWEA’s MAP test), also were the lowest scoring in the place value and number sense sub-domain. Over time and several years teaching in different settings with different grade levels, I’ve come to learn how very important number sense is, and I’ve picked up some great strategies for teaching it along the way. With that group of 2nd and 3rd graders I was able to target their number sense needs. We grouped those kids into an intervention group where I worked on a variety of skills trying to strengthen their understanding of numbers. At the end, they were much stronger with abstract number concepts and improved their overall scores. Working on number sense beyond K and 1 continues to be important, and can help your struggling students succeed in math. Here are some ideas for strategies, games, and other resources for students with low number sense. These are also great practice for your whole class! If you’re looking for more behind what number sense is and why it is so important, you can read more about it in my Building Number Sense post. One of my favorite ways to work on number sense is by doing Number Rounds. This is a little game I thought of that’s played similarly to Sparkle. The whole class stands in a circle and I choose a starting number and a rule, e.g. Add 10 starting at 54. Every time we reach a new hundred, that student has to sit down. So, the student to the left of me would say 64, then the next student would say 74, then 84, 94, and then the student who said 104 would sit down. We’d continue playing until there is one person left standing. The students struggling with this concept get to hear it throughout the game. Even the students who seem to have a solid foundation struggle a bit trying to add a new “place” mentally. It can be played with any number of digits and anything can be added (10’s, 100’s, 100’s). I also thought of playing the game starting with a larger number and working backwards and the first person to go below zero is the winner. I might try that out this year. This game has been a favorite in my classroom in first, second, or third grade, and is a quick way to build number sense and mental math skills while getting students moving and keeping them engaged. For other ideas for getting kids up and moving in the classroom click here to check out my post on adding movement. -How do you say this number? -What is the number in the thousands place? -What is the value of the 6? – What is this number rounded to the nearest hundreds place? After a few questions, students would then try to guess who chose them and would switch places in traditional Heads Up, 7 Up style. Students were really excited if they got to stay up front for both rounds and they knew they were off the hook for answering the “hard” questions. Sometimes, I’d only ask questions of the kids who were standing because they were chosen. It’ a fun twist on a traditional game all of the kids already know, and can be easily modified to work with smaller numbers by only having 4 or 5 students at the front. Build It! is a super simple game where students try to beat their partner by building the larger number possible. It’s a quick prep game or center that has several different extension possibilities. Head on over to the Ellison blog to see how to prep and play. Of course, any numbers can be used- I’ve even picked up some great number stickers in the clearance from the Target Dollar Spot. I use my Football Fever centers in the fall in third grade to review place value skills within 1,000 before we start really working with larger numbers. With these centers, my kids practice matching standard and expanded form, comparing numbers, ordering numbers, and practice mentally adding and subtracting 10, multiples of 10, and 100 with 2 and 3 digit numbers. I even added pages to practice adding and subtracting two numbers so I could use the same set of centers for even longer. Plus, these are easy prep! You can place the sheets in sleeves, or just have students write with pencil. I laminated the cards for longevity, but to save time you can just print and go! To see more about the centers and to check out the preview with samples, click the image below. I also created a similar set of centers that I used in 2nd grade in the winter so they are snowman themed. They practice the same exact skills as the football set. You can check them out by clicking the image below. This is a perfect anchor chart for showing the ways to represent a number from Teaching with a Mountain View. This anchor is also easily adaptable to work on any size number you need. 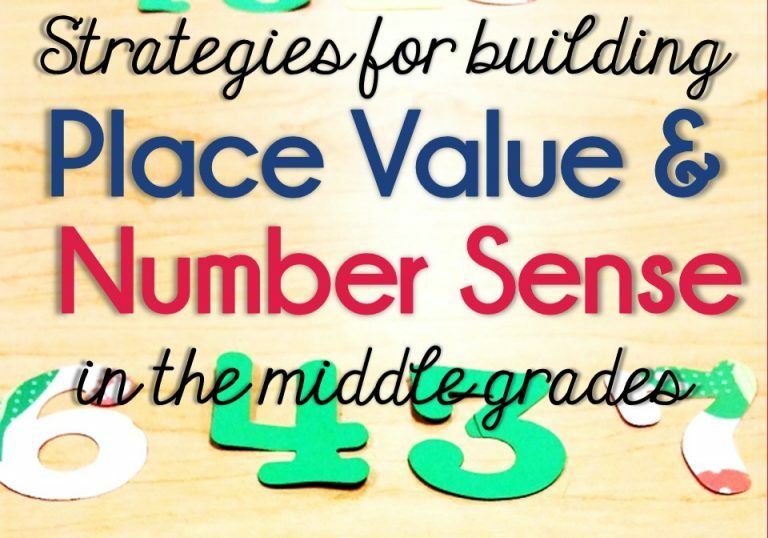 Mary also shares a TON of other great ideas in this post for working on place value. Place Value Puzzles are a great way to practice matching standard form, word form, and expanded form. You could also use a 4 puzzle set to add in base 10 representation, or just swap it out for one of the others. Head on over to the Ellison Blog to see how I made these quickly using Ellison dies and used them as a center in my classroom. We have to continue to build students’ practice to include larger and larger numbers to help solidify place value and help them build their number sense to be able to manipulate numbers easily. I use my Rocking Out with Place Value unit to help me push students to working with large numbers and it allows me to differentiate for students who may not be ready to do so. Students practice manipulating numbers to 1,000, 10,000, and 100,000. In the tens columns centers, students practice adding and subtracting 10, 100, or 1,000. This center really helps students see the value of each place and students get much needed practice with regrouping into new hundreds, thousands, and beyond. The Rocking Out with Number Puzzles center has students visualizing the number on a hundreds chart and identifying the numbers that would surround that number while adding 1 and 10 to that number. The Rocking Out with Place Value unit features 3 different activities all tiered to 3 levels of numbers giving you 9 different centers options. To check it out on TpT, click the image above or here. These Expanded Form, Standard Form, & Word Form task cards are designed to be a Write (or Solve) the Room, however, they can be used in any way you choose. The cards alternate between each form on the cards. I also offer two different recording sheets for this one: one that is completely blank, and one that has the given card pre-filled out on the sheet. This set of task cards is FREE so head on over to my TpT store to download it! Number sense is truly built through ongoing, daily practice. One way this can be achieved is through a Number of the Day routine with students practicing place value standards every day with a new number. I have 6 different pages practicing a range of skills, and working with 2-digit to 4-digit numbers. One version is ready to print, label the day’s number, and copy (easy peasy!) The second, is a Google Drive file- perfect for using digitally in Google Classroom. You can get both of these files, and more ideas for building place value and number sense skills in your classroom, by signing up for my newsletter below. You’ll get the printable version right at sign up, and the digital version will be in the first email you see after beginning. It walks you through sharing with Google Classroom in case you aren’t familiar. Additional ideas and resources will also be sent throughout the next few weeks to help you build number sense in your students all year long! Join our mailing list to receive more freebies and strategies for building number sense and place value skills with your students. Thank you for sharing your hard work. It is so true. So many of our third graders just don’t have number sense and these activities are going to help. We start school next week and I am going to include them right away. Thanks so much for your comment. I hope a couple of the ideas help your kiddos! This post could not have come at a better time! My students are struggling with place value concepts. I so appreciate the many links and ideas you provided!